For over 30 years, students in the Vision Thru Art program have called Allens Lane Art Center their home. 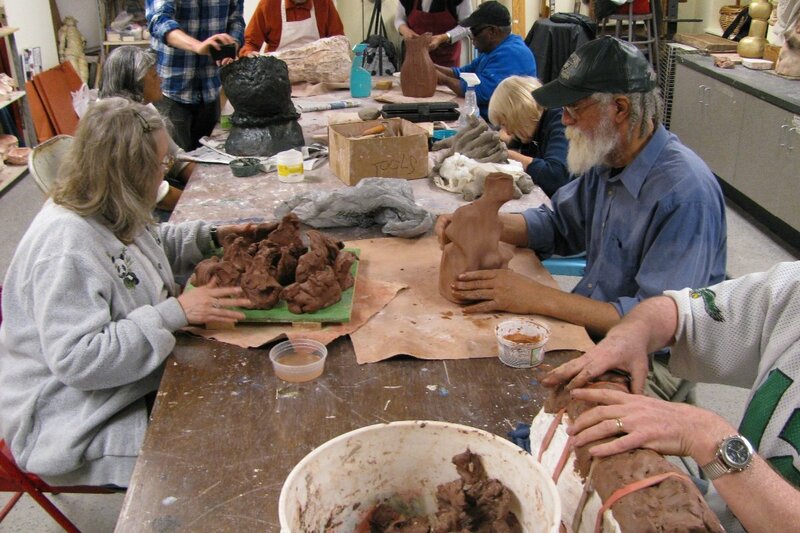 This is a very unique program that gives top level instruction to over 40 blind and visually impaired artists as a weekly sculpture class that runs from September through May of each year. Many of those who have been with us for years and have said that the class itself is the highlight of their week. Aside from a dedicated staff and a team of amazing volunteers, what really makes this program so special is the way that we approach it. It's not what people assume. It's not art therapy. It's a sculpture class for people who happen to be blind. That approach makes all the difference because what we are trying to do is to help these artists bring out their inner vision. Our success is seen in the stunningly beautiful works that they create and the smiles on their faces when they arrive each week for class. Because the majority of the artists in the program are on fixed incomes, and because the program is so important to who we are as an organization and just how much this means to the participants in the program, several years ago we made the class tuition free so that we didn't have to turn anybody away. We know there is a great demand for this as each year the waiting list for this programs grows and grows. We also know just how much it means to the students in the program by what they tell us. The most common thing we hear is that the program is the highlight of their week! It provides them with more than just instruction, it gives them a safe place where they can make life-long friends. Our funding goal of $10K gives us one year of classes. $20K gives us two years, etc.. etc... BUT our ultimate goal of $250K would enable us to create an endowment for the program so that it could be funded indefinitely. Sadly, this program won't be able to continue if we can't help secure its future. One of our major supporters is no longer able to help us and we need to raise funds to help pay for the program. Staff salaries, supplies and materials, it all adds up. We need your help to make sure we can continue offering this life-changing program to the blind and visually impaired community. We need you to help make this happen. To learn more about this program, we like to encourage you to check out our website at: allenslane.org - Thank you.